For my 0.2 Release, besides working on a gladius bug, I also decided to start working on the InputJS project. To get started with the project, I had to buy a controller, since I don’t have one and the whole project involves mapping controllers to the gamepad API provided by mozilla. I started searching for a cheap controller, and luckily found one add on kijiji for a Xbox360 wireless controller with a usb adapter for $15. I bought it. Once I had the controller, the next step was to set it up my laptop so I could run inputjs. 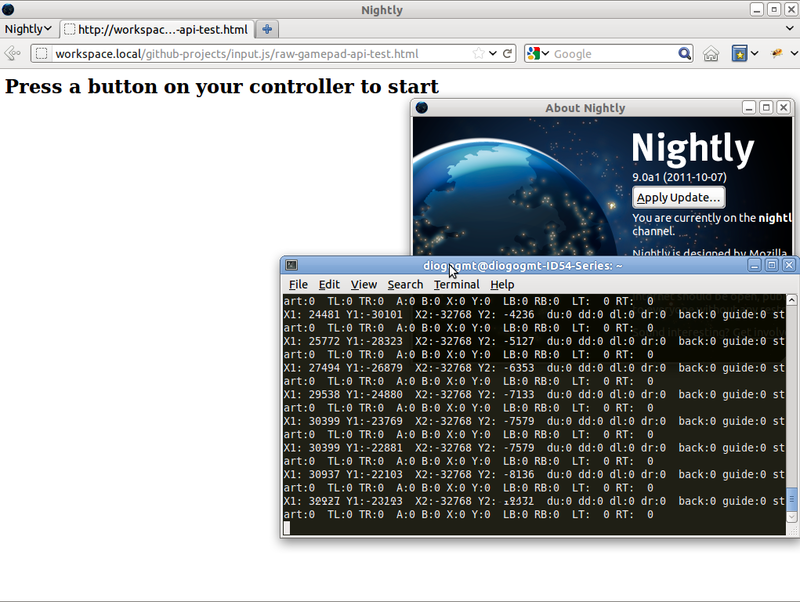 I downloaded and installed the nightly build from his server, version 9.0a1 (2011-10-07). With the right browser installed, I started looking for the correct drivers for the Xbox360 controller. I found some old drivers and tutorials on the internet that didn’t work. At first I thought I had installed the wrong version for the firefox build, but then I asked Raymond, that is also working on the inputjs and he told me that he downloaded the same build from jbuck’s server and it was working for him. Knowing that I had the right build version, I thought the problem was on the driver for the controller, but I tested and it was getting all the controller events. Because I was trying to run inputjs on Ubuntu, I asked a friend to install it on Windows. He did, but had the same problems that I had on Ubuntu. The Os recognized the controller, but the browser didn’t. He was using a Xbox360 wireless controller. I still haven’t figured it out what is happening, and why is not working, but I guess it has to do with the fact that it is a wireless controller. I’ll take a look at the source code for the JoystickAPI that’s implemented in the firefox nightly build and see if I can fix the problem there. When I get everything working the plan is to implement the inputjs library in a existing game.